Are you among the 120 million Americans who are missing at least one tooth? You have likely tried traditional tooth replacement options to fill the empty space, like a bridge or a partial. While they have completed your smile, you keep hearing about the benefits of dental implants. Now, you are wondering why are they so popular? They are far different from conventional treatments, allowing them to offer exceptional advantages that are not possible with other options. Over 500,000 people per year turn to dental implants because they are the closest thing to their natural teeth. Unlike other treatments, they replace both the root and the crown. Your jawbone fuses to the post to create a sturdy foundation for the tooth. You never need to worry about any slipping or irritation again. In fact, you will regain as much as 70% of your biting force. Using high-quality all-ceramic material makes the crown look just like a real tooth. It is customized to match the size, shape, and color of your remaining natural teeth to blend in seamlessly when you smile. Dental implants are the most predictable and reliable solution to treat missing teeth. As a result, they have the potential to last for several decades. With the right aftercare, your implant posts should never need to be replaced; however, the restorations will suffer from daily wear and tear. On average, you will need new restorations about every 10 years. Dental implants offer over a 95% 10-year success rate. The use of advanced technology and biocompatible materials allow them to be more successful than other treatments. Each missing tooth causes you to lose bone density in your jawbone because of the lack of a root. This causes you to lose density in your jaw, which compromises your remaining natural teeth. Dental implants are the only solution to preserve your bone density. The implant post acts as a new root to stimulate bone growth. This helps to protect your teeth from further complications, like alignment issues, tooth decay, and gum disease. By stimulating the jawbone, dental implants can help you maintain a more youthful appearance by protecting your facial structures. It helps to avoid premature sagging and wrinkling of your skin that is common with missing teeth. 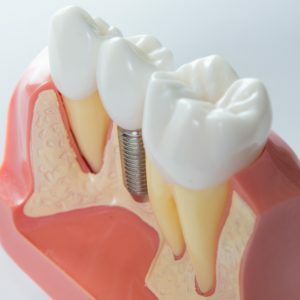 Dental implants have become the preferred solution to replace missing teeth, and for good reason. Now, you can harness the benefits they offer by seeing your implant dentist. Flenniken Family Dentistry strives to provide a comfortable and caring atmosphere while meeting the needs of our patients. In addition to general dentistry, we offer many advanced services, like dental implants. We can help you complete your smile using the latest innovations in dentistry. Contact our office today to see if dental implants are right for you. We look forward to seeing you smile.